A Companion to Gender Studies presents a unified and comprehensive vision of its field, and its new directions. It is designed to demonstrate in action the rich interplay between gender and other markers of social position and (dis)privilege, such as race, class, ethnicity, and nationality. 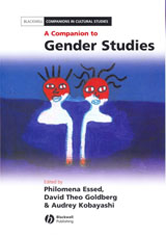 Presents a unified and comprehensive vision of gender studies, and its new directions, injecting a much-needed infusion of new ideas into the field; Organized thematically and written in a lucid and lively fashion, each chapter gives insightful consideration to the differing views on its topic, and also clarifies each contributor's own position; Features original contributions from an international panel of leading experts in the field, and is co-edited by the well-known and internationally respected David Theo Goldberg.